Starting pitcher Robbie Ahlstrom (Chemeketa CC) danced around trouble all night before Heat right fielder Cole Lemmel tied the game with a solo home run in the fourth. CHICO, Ca. – The Rogues struck first, when Blake Baumgartner (UC San Diego) singled up the middle to score Riley Kasper (Saddleback College) from second base in the first inning, but the Heat scored five runs in the seventh and eighth innings to put the game away. Baumgartner made a number of terrific plays in the hot corner, including a diving grab on a ball hit down the line by Heat second baseman Andrew Meggs. With the tying run at third base, Baumgartner made the grab while on his belly, got up, and made the throw over the first in time to rob Meggs of an RBI. 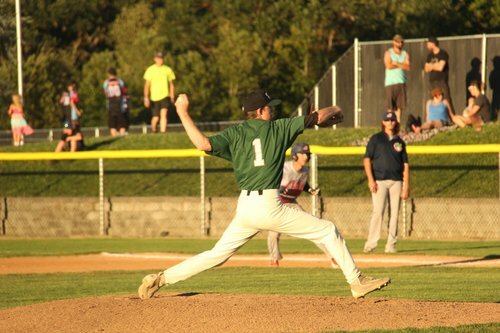 Starting pitcher Robbie Ahlstrom (Chemeketa CC) danced around trouble all night before Heat right fielder Cole Lemmel tied the game with a solo home run in the fourth. Chico then took the lead when Meggs doubled down the left field line to score Brandon Stewart. The series will continue tomorrow and Wednesday, first pitch for both games is scheduled for 7:05pm. This Saturday is Christmas in July at Harry & David Field. The Rogues invite fans to bring canned goods to the game to receive $1 off the price of admission for each can donated (limit 12). The cans will be donated to Access in Medford. The Rogues players will be wearing special Christmas Jerseys, which will be up for auction during the game. 100% of the proceeds from the auction will benefit Access in Medford.